Why do you need your own team in China? Handling operations by yourself from across the ocean while dealing with culture, language gaps, and time zones is not very easy. It can be difficult to verify that the information you receive is reliable and coming to you in real time. For customers, being able to trust this information brings peace of mind. It’s not possible to make sense of the information you hear and see remotely without relying on a trustworthy agent that will convey your questions and push for acceptable answers. Sending your own people is not always possible every time you need to, and Chinese team building is something that requires skills and know-how. You need to know that support is trustworthy and available when you need it. All these are extremely difficult when you don’t have a person or a team in China whose interests are aligned with yours. What are the most used solutions? Some companies commit very little resources towards operating businesses in China. Their managers can afford to fly once or twice a year, spend a week or two traveling between factories, and verify the operation’s success for themselves. Other companies have an extensive amount of business in China that makes opening a company and hiring a dedicated full-time team specializing in China business services a viable economic solution. These companies must ensure that they are fully considering the Chinese team building process before hiring personnel and that they have all the necessary skills in-house. The magnitude of most businesses places them somewhere between the two sizes mentioned above. On one hand, two trips to China are not enough to cover all of a business’ needs. Continuous trips are very expensive, degrade the inspection teams frequenting China, and impedes their progress in completing home office projects. On the other hand, setting up a company in China and hiring a dedicated team can get very expensive. Chinese team building requires both money and time, resources that should be considered when managing a team from another culture thousands of miles away. The challenges involved in managing an offshore company is a whole different topic. For now, let us just say that out of control costs, keeping a low turnover, and maintaining morale and motivation are just a few of those challenges. Not to mention there is a risk of hiring non-loyal and unethical employees that become foes instead of indispensable resources. Foreign companies operating in China, have a few approaches for operating their business in China. Some choose to frequently fly teams of people to China; others make an effort to open a very small office with a very small team in China. A third approach to dealing with these challenges is outsourcing your company’s presence in China to a third party China business services provider you trust due to their capabilities and their ethics. Some organizations outsource very specific tasks like quality control and factory auditing. Others pay manufacturing agents a monthly fee to follow up their orders and coordinate shipments. No matter which approach your business takes, trust is a key component. If you fly in your own employees, you must trust them to not only diligently perform their duties but also know their way around China. This requires the capability to communicate effectively with their Chinese counterparts and correctly decipher what they see and hear despite culture and language gaps. If you open your own company, you have to trust your local team to be ethical, guard your resources, and send you reliable reports. And if you choose to work with third party China business service providers, you have to trust them to put their knowledge and skills to work to your advantage in order that you receive maximum value at minimum cost and time. Managing a team that comes from a different culture, in their home country is very challenging. codes of behavior and etiquette are different. Without the right experience, red flags can go unnoticed. So how will you know which option is the best for you? Your team, whether they are your home office employees, your full-time employees in China, or a third party team, must have the skill set, experience, and know-how that will enable them to do their job. The people working for you in China must have an agenda aligned with your own. The people working for you must be highly ethical. There are many non-Chinese professionals who have worked in China for many years and know it like that back of their hands. Other highly technical people who know nothing about Chinese culture, cannot communicate effectively with people within your manufacturer's organization. They will definitely be able to let you know what is wrong with the production process, but at times they may not be able to convince the factory to make changes and improve product quality because they don’t know how things work in China. Your full-time local employees may have valuable local industry knowledge and relevant China experience, but sustaining the infrastructure needed to enable them to work for you (registered company, company admin, office space, employee benefits) can get very expensive, and could require a lot of your time and attention. When we say we are different, we mean it. You are in full control of your cost. If your people back home have limited China experience and frequently flying them to China costs too much; if hiring a full time China team and the necessary infrastructure required to allow them to work legally for you is too expensive; and if working directly with your factories and getting net factory prices are things you feel you can’t compromise on, then you should consider finding an experienced China-based service provider. You should consider finding a service provider that is able to execute tasks on your behalf, is reputable and has the kind of references that will make you feel comfortable. CSO is uniquely formatted to act as your team in China; your extension on the ground. Our business model aligns our interests with those of our clients. We do not take commissions, not from you and definitely not from your suppliers. We do not add any components to the factory’s price and do not prevent you from speaking to the manufacturer directly. On the contrary, we encourage you to deal with your factory directly and become as independent as possible in China within the shortest time frame. Control your cost. Get Reliable information. Have a flexible team on the ground. With CSO, you enjoy the best in China business services and Chinese team building. There are no long terms contracts or long-term commitments of any kind. There is no need to sign office leases or enter an employer-employee relationship. You can hire us whenever you need us, for as long as you need us. It isn’t always necessary to maintain high levels of fixed costs. An unexpected downturn, or operating your business during the slow season can make operation expenses untenable. Our business model is straightforward and simple; we sell our time and skills and give you the freedom to decide how to utilize them. It is impossible to forecast in advance all your future needs and necessary tasks that will be performed on your behalf in China. Working with us lets you easily change the scope of services you order with a short advance notice, in the exact manner you would with your own full-time team in China. CSO works with reputable brands and has a reputation of an ethical, professional, and capable China business services provider. We believe that our reputation is our most valuable asset and that our reputation’s foundation is our customers’ satisfaction. When we work for you, you can have the peace of mind that we make your best interest our highest priority. Since your satisfaction is so important for us, we work hard to bring you value. We prioritize providing quality; that includes high-quality service and high-quality information. We know that time is a scarce resource for you. Therefore, we effectively communicate what you need to know, in real time, clearly and succinctly in a way that will let you know the true situation concerning the task we are processing for you. It is for companies in search of factories with the ability to manufacture a great quality product at a competitive price. Companies that cannot afford paying commissions or third party margins on top of the net factory price. Companies with a complicated product order or a complex to produce product. Companies that must work directly with their manufacturers for improved communication and fast decision making. Companies for whom quality and cost are important uncompromising concerns. Companies who want to be involved in the order follow up process, but cannot afford to let it consume too much of their time. We realize that our customers have dynamic businesses prone to changing over time. This is why they need a dynamic and flexible team to work with them. We designed this service for SME’s that have a small or no office in China. We will provide your business with a professional and experienced multifunctional team with extensive local knowledge capable of supporting your company with a wide array of changing tasks. Our team will quickly learn and adhere to your preferred working style; you can take comfort knowing that your company won’t have to repeatedly reteach your operational methods. Here at CSO, we let you focus on the big picture of growing your business, by managing the stress and time you have to invest in the nuts and bolts of operating in China. We designed this service keeping in mind, that for the vast majority of our clients, the manufacturing of their products is a very important issue; but it cannot take up too many resources, and it has to be managed in a way that lets our customers focus on growing their business. This service is also suitable for bigger companies, with a large team in China that is dedicated to nonoperational tasks, such as sales and marketing. This service package is designed for companies who need our support for a specific task from beginning to end. Our assistance can be rendered from either the office or a location of your choice inside China. This service package is designed for companies who need support handling routine needs a few days every month. Just like the project package, our assistance can be provided by the office or at an assigned location inside China. 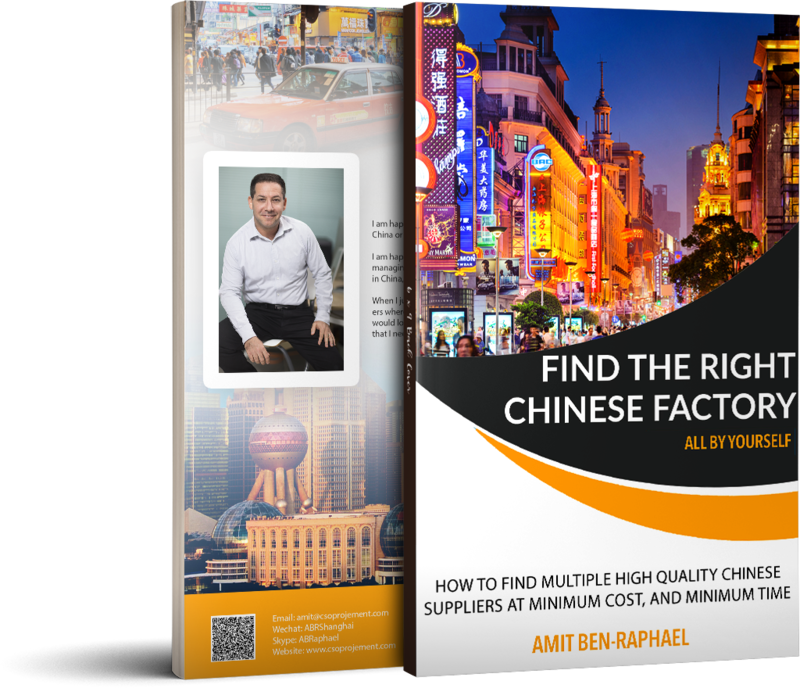 Find the best factory for you – Fast!